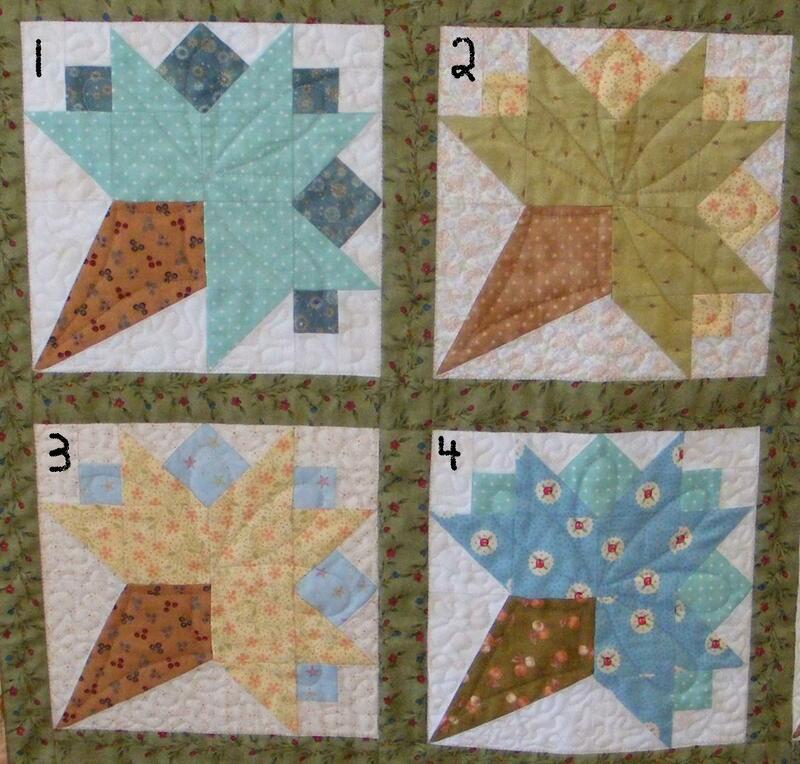 Quilting Adventures: One of these blocks is not like the other....! One of these blocks is not like the other....! Yesterday, Stephen reminded me that I had not blogged in quite some time. How can that be? Time really is relative! Thank you Einstein! In the meantime, I've been plugging away at various projects; so I have nothing completed to show you at the present moment. Since I like to play games, I thought we could play one together. If you leave a comment telling me which block is not like the others, I'll put your name in a draw for a prize. Oh.... this is going to be fun! Deadline for the draw is July 1, 2010. Good luck! Thanks for playing with me. Have yourself a great week! Cheers! Oops, block 1 has a point turned. I like the quilt, however. No need to point it out to anyone! Hard to notice, but block 1 is different that the others. I agree, hard to notice but block #1 is a little off. I like the down-turned petal though. 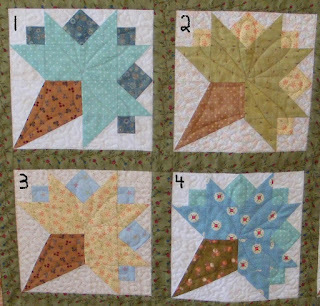 Such pretty blocks but it appears that Block 1 has its own little quirkiness - it just adds to the the quilt's charm! Block number one is funny. Would you have had to piece that triangle the other way for it to be "correct"? Block #1 has dark HST turned wrong. You have to look real hard to notice it. I have seen quilts in magazines that have errors in the piecing. I still like it even with your "humility block". Number one! But don't rip it out or change it! It is just as wonderful as the rest! Block one...oh dear...we all do it one time or another...shows you are a busy, creative woman. leave it in...it enriches the quilt & put a note on the back for future quilters...or just let them ponder...why did she do that? Number 1, but I had to look real hard! Hmmm...I wrote a really long comment and it disappeared. Must be summer solstice. Even with block #1 a littl tweaked, it is a fabulous design and one of my favorite blocks. I did one last year all by hand as we took road trips. I think the ice cream in block number 1 is melting Carole, lol. Hmmm, do I recognize the cone fabric in a couple of those block? Hi there, #1 is not like the other not like the others. Your quilt is beautiful. It took me a while, but I found it: Block 1. Number one is not like the others. I feel like I am on Sesame Street! Lol. Oops- bottom row of block 1! Probably never would have noticed had you not pointed it out! I do believe it is #1. I have lots of humility blocks - they kind of keep me grounded! One of my favorite segments of Sesame Street as a kid. Block #1. It is Block #1.However none of us are perfect. I have a log cabin baby quilt that has a block turned the wrong way and even the quilter didn't notice the boo boo. It was hard to find - but block # 1 is a "very Little" off. Love the quilt. Wow, you really, really have o look closely to find it! Good eyes to whomever found it the first time! Hi Carole -- well funny but it took a little while to figure it out but once I saw -- block #1. Wow - i had to look very closely to see the ice cream cone dripping in block one. #1! I was so proud of myself in figuring that out. There's 2 half-square triangles turned differently for the ends of the ice cream! It took a bit to find it but block 1 is not like the others....teehee. Now you have a wonderful memory of this quilt which is different then all the rest. Glad to see you are blogging, say "Thanks" to Stephen for me. Block 1 is not like the others. PS..Block 1 has a slight artistic interpretation. Block one is not like the others! Block #1 has the corner turned the opposite way. Hard to figure so I wouldn't give it a second thought. The blocks are really pretty. Block 1 - but they are all so pretty! Block #1 has a point turned the wrong way; however, if that was your design choice then #2 doesn't have any blue in it. Yikes -- it's block 1 -- and I didn't even cheat LOL. I probably wouldn't have noticed though, if you didn't tell me! I had to look twice but found it...it's block #1 that is not like the others! I like the vintage look of your blocks and the humility block just adds more charm. Thanks for a chance to win a prize. I didn't peek at the comments, and it took enlarging the photos and studying them before I found that blue triangle turned wrong in Block 1! Very pretty posies tho! How fun! I am way too late for the draw, but I really couldn't figure out which one was different! I had to look at the answers in the comments to find out...and of course, they are right!